A Place to Bury Strangers announce new LP & 2015 tour (dates, song stream) — will they play DbA one more time? 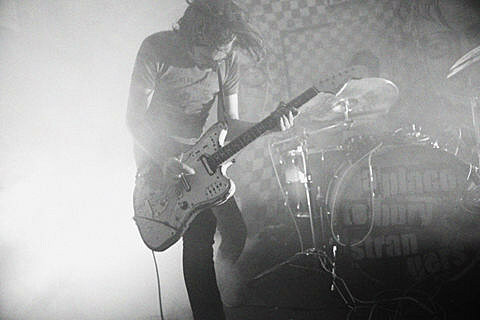 A Place to Bury Strangers will release their new album, Transfixiation, on February 17 via Dead Oceans. The first single is “Straight” which adds a little bluesy funk to the band’s signature noisy style. You can stream it below. You can also watch a teaser for the album that was filmed at APTBS’ show at Death by Audio last month that ended with Oliver Ackerman’s guitar jammed in DbA’s drop ceiling. That’s below too. After DbA closes, life will go on for A Place to Bury Strangers (obviously) with the new album and a lengthy 2015 tour that kicks off at NYC’s Music Hall of Williamsburg on February 17. Tickets for that show will be available soon.